Hello, fellow drone lovers! Hope you have been enjoying the summer to learn and practice your drone flying skills and most of all have fun with it! Today we bring you a review of a recent release in the low-cost toy drone market, the newest addition to the JXD series (we have already reviewed previous models, and they are great! ), will the new model correspond to the high expectations? We will find out on this JXD 510G review! For all First Person View drone enthusiasts or even for those who are just starting and looking for a real time video transmission drone for a very affordable price, this might just be the drone you have been looking for. Follow us as we take a deeper look into this quadcopter and find out if this complete FPV package is a good value for your money or not. We review all the main factors of the drone. Its material and design, camera and First Person View transmission, features, battery and flight time, remote controller and maximum control range. All you need to know to make your own judgment and decide if it’s a drone which fits your needs. Don’t forget to check our Top 10 Drones Under $100 article for more drones within this price range! Now without further due let us move on to our JXD 510G review! Unlike the previous model the JXD 509G that had its design based on Yuneec Q500, the upgraded version JXD 510G has its own unique design. In my own opinion it looks much better, it has a much more aggressive look (only available in black and green color). As expected the quadcopter is made of ABS plastic. This product is cheap to manufacture, but it is both light and durable enough to resist most common crashes and hits. 510G has a landing frame, also made of ABS plastic, somewhat resistant and useful for more harsh landings. The four motors and two propellers (on each motor) are surrounded by a protective frame (non-removable) which will ensure that the props won’t bend or fall break. 4.5” monitor can be detached from the remote controller and the sunshade protector is foldable, all made of ABS plastic too. If you are a beginner (or considering buying this drone for a kid) you should be aware that it won’t break easily, however always fly safe, both indoor and outdoor and avoid crashing at higher speeds against trees and walls to ensure your drone will last many years! 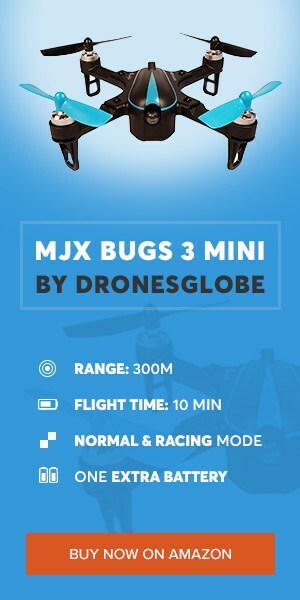 JXD 510G is a toy quadcopter aimed at First Person View drone enthusiasts on a low-budget. JXD 510G uses the same 2MP camera of the previous model (509G), it hasn’t been upgraded. Unfortunately, an image does have some ‘jello effect’; the pilot may have to adjust propellers and camera mount to reduce vibrations of the camera. The drone can record video in 720p resolution and can also take photographs. Camera angle can be manually tilted 30º so the pilot can acquire different POVs. 510G transmits the live video in 5.8Ghz frequency (there is WiFi version, the 510W). It displays good quality image video, and live video transmits with no delay/latency, although it depends on flight conditions. Included in the complete FPV package, there is a 4.5” FPV Monitor with foldable sunshade (for those sunny days) and removable antenna. All the required hardware to fly FPV right of the box is included in the package; you don’t have to worry about purchasing more equipment. Note: JXD 510G is compatible with third party Boscam capable goggles and monitors. When JXD 509G came out, it surprised us with its full set of features, superb for such an affordable toy drone. 510G manages to cost even less and still present the same surprising set of features. If you are looking for an overall complete drone experience for a very affordable price, you will be pleased with 510G. Besides coming in a complete FPV package, 510G also includes useful features for both beginner and expert drone pilots. First of all let’s discuss the feature that makes 510G stand out from the shelf: Altitude Holder (Barometer Set Height). For the readers, those who are still new to drones, it means 510G is capable of maintaining a 1-meter altitude from the ground without pilot’s input. This allows the pilot to focus on recording video, take photographs or even watch the real time video transmission without worrying about the throttle. More important features are the One-Key Home Return, which makes the drone come back to the pilot, Automatic Landing (drone gradually stops its motors and lands). And of course, three other features which have become standard, the Headless Mode for easier orientation despite where the front of the quadcopter is pointing at. This feature is very useful for children and beginners as it makes the drone easier to control. Of course, it also includes LED lights for night flights and 360º aerial stunt with just the push of a button on the 2.4 Ghz remote controller. As you can see, JXD 510G comes with more features than most drones within its price range. Enjoy! This is another factor which doesn’t have much improvement from the previous 509G model, mainly because it also doesn’t need. 510G uses the same 3.7V 600mAh 30C Li-Po battery, a good 600mAh battery which suits this drone well. It powers between 6 to 10-minute flights. Remember that you can always purchase extra batteries (reasonably affordable) if you wish to fly longer. Just keep in mind that it’s important to let the motors cool off between battery exchanges, otherwise, on hot weather, you may burn the motors. Original package includes one battery. JXD 510G comes with a 2.4 Ghz controller, relatively straightforward to use, gives access to all you need and is powered by four 1.5V AA batteries (not included, you need to buy separately). Unfortunately, 510G maximum control range seems to be considerably 50 meters less than its predecessor, therefore around 100 meters of maximum range. 100 meters is still good; it’s the average control distance for drones within its price range and even higher-budget toy drones. If you are a beginner and afraid to lose eyesight of the drone at 100 meters, don’t forget you always have One-Key Return to make it easier to fly the drone back to you. THE GOOD Very affordable drone with a complete FPV package. Amazing set of features including Altitude Holder (Barometer Set Height) and Automatic Landing. Neat design. 6 axis gyro makes it well balanced and easy to control, it has a nice hover. Live video transmission is good quality with no latency at all. Flight time is slightly above average (although it depends on camera usage). THE BAD Image may display ‘jello effect’, not the best at flying in windy weather conditions. Sunshade on the monitor is not very effective. BOTTOM LINE JXD 510G Predator is a highly affordable drone with a complete FPV package ready to fly right out of the box. A slightly upgraded version of the previous model, arguably for better or worse, depends on the aspects we are looking at. If you are looking for an affordable easy to fly a drone, 510G is a very good choice and it suits both beginners and experts. Considering its price, JXD 510G is a good value for your money and it is worth buying, for yourself or even as a gift to someone you love. What did you think of our JXD 510G review? Have you flown one? Are you considering purchasing it? Let us know in the comment section below, also if you have any additional questions feel free to ask! We at Drones World love to read your comments and discuss with you the products we review. Also, read our JXD 509G review to compare both products. Don’t forget to bookmark our page and visit us daily for more reviews, news and guides! Happy flying fellow drone enthusiasts!